In the previous post we learnt how to display numbers in different notations. The output was different for each numeric base (for the convenience of the user of the program), but from the computer’s point of view it didn’t make a difference: all these values were stored and handled internally in exactly the same way. Today we’re going to look at data types. These have an impact on how numbers (and characters) are stored in the computer’s memory, and how the computer handles the data during arithmetic operations, comparisons and function calls. 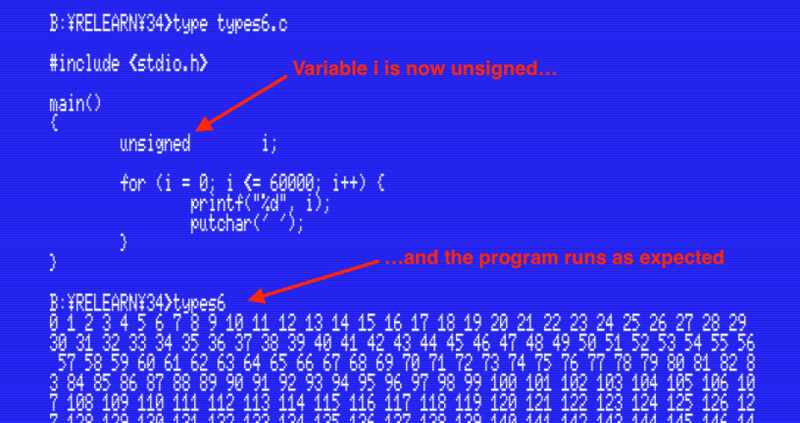 What we’re going to see in this post is extremely important for coding error-free programs. Try not to skip it even if it may seem boring (I’ll try and keep things interesting). If anything isn’t clear then ask in the comments below. I’ll be happy to help. The computer sees 0x9000 as a negative number and 0x3000 as positive. Therefore, if we compare them the result will be that 0x3000 is bigger, right? How can this be? The first program told us that 0x9000 is negative, so 0x3000 being positive must be bigger than 0x9000. What’s going on here? What’s happening is that MSX-C by default assigns the unsigned type to hexadecimal data. Treated as an int, the binary number above is -28672. The same binary number, treated as an unsigned represents the number 36864. 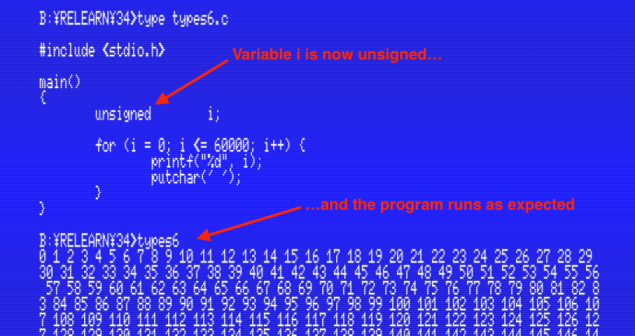 This program defines two variables of type int (i1 and i2) and two variables of type unsigned (u1 and u2). To each pair we assign the same hexadecimal values (0x9000 and 0x3000). Next we’ll look at this from the computer’s point of view. Other compilers support additional data types in order to handle very small or very large real numbers in floating point notation (types float and double) and also very large integers (the long type). MSX-C supports natively just the three types above, although the MSX-C Library package includes functions to work with floats, doubles and longs (both signed and unsigned). We’ll study these in a future post. We haven’t seen the cast operator before. It consists on the name of a data type enclosed in parentheses, and it’s used in front of a value, a variable, or an expression to force the compiler to convert the value into the type inside the parentheses. Like int, this type is 16 bits long. There is no sign bit, so all the bits are used to store the value. That’s why unsigned variables can’t store negative numbers. This program is simple enough, right? There’s a for() loop that counts from 0 to 60000, printing every number on the screen one after the other. You may think it should run as expected, but it doesn’t. Go ahead and compile it yourself and confirm. Think for a few minutes and see if you can guess why this program doesn’t work. I’ll wait. Were you able to figure it out? Here’s the reason: the variable i was declared as an int. Where does this -5536 come from? The unsigned value 60000 in binary is 1110 1010 0110 0000 (I added spaces for clarity). MSX-C takes the same binary value (1110 1010 0110 0000), but casts it into an int, which is a signed value. And 1110 1010 0110 0000 viewed as an int is -5536. 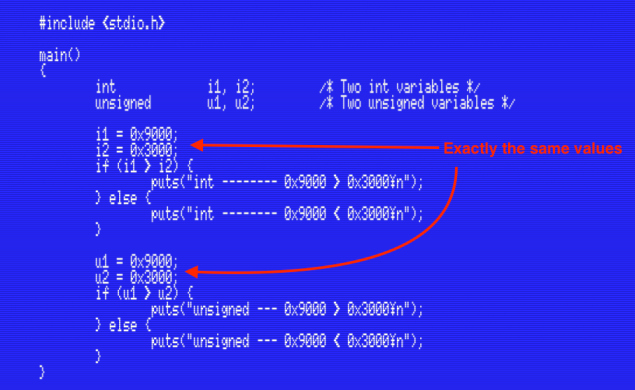 The loop exits immediately because of the way the compiler handles the loop condition: it substracts the variable from the constant value and looks at the result. If the result is not negative then the condition is true and the loop continues. If the result is negative then the condition is false and the loop ends. Because we mistakenly declared the variable i as an int, MSX-C casts the value 60000 into an int as well, so the loop is over even before it starts. char is another unsigned type. It only takes 8 bits (1 byte) in memory. The other two numeric types in MSX-C (int and unsigned) both take two bytes in memory, while char data only takes one. Keep that in mind when thinking about the size of data structures (we’ll learn about that in a future post). 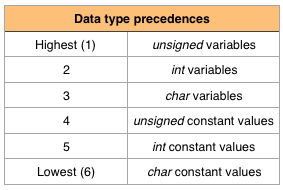 In other words, when we mix two or more data types in an expression, the types of the variables always take precedence over the types of the constants. On top of that, unsigned values take precedence over int values, and int values take precedence over char. In this post we’ve seen very important concepts about the data types in MSX-C. If anything isn’t clear then read it again and don’t hesitate to ask in the comments below. 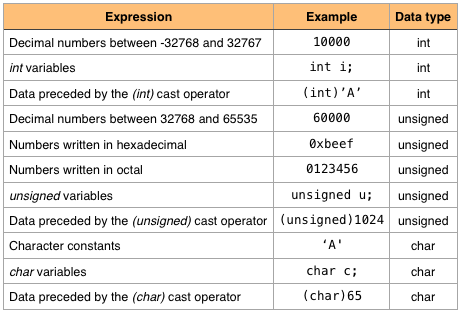 We’ve learnt about the unsigned, int and char data types: their value ranges and bit sizes. We’ve seen how MSX-C decides what data type to use during compilation. We have also learnt how to use the cast operator to explicitly convert data of one type into another type. Finally, we have seen what data types take precedence over the others in our programs.